We ran product invention workshops with the BBC, ways in which history could be explored and explained using digital media. We came up with 30 or so ideas which got narrowed down to 5 ‘microbriefs’ for possible future prototyping. Microbriefs are our way of expressing products that test an idea by making it real, and the brief can be taken forward by the client internally, with the help of an agency, or with BERG. Dimensions is a feature on websites that juxtaposes the size of historical events with your home and neighbourhood. You’re hearing about the span of the base of the Great Pyramids, or the distance of the book depository from JFK, or the extent of the Great Fire of London… Dimensions overlays this map on a satellite view of where you live. 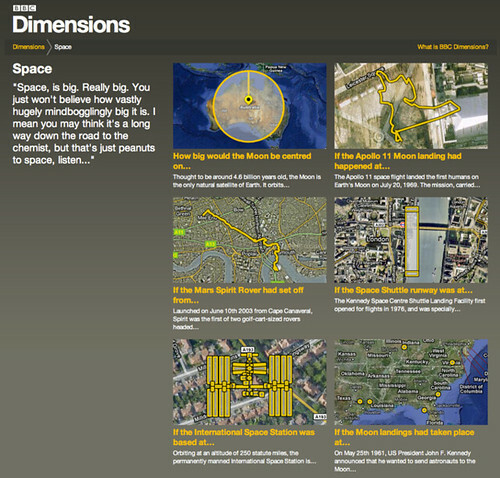 As a second phase of the project, we took on Dimensions and created howbigreally.com. howbigreally.com is a website that shows shapes, distances, and walks over a satellite Google Map of your neighbourhood. 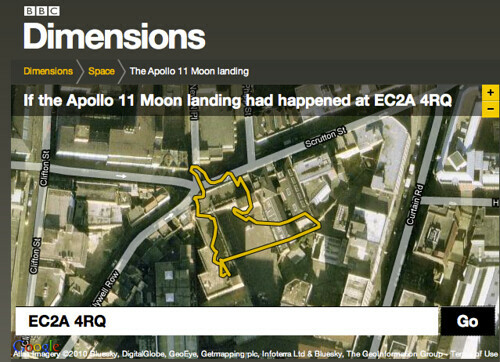 Some of the several dozen dimensions on the site are the Apollo 11 Moon walks (surprisingly small! ), the Pentagon, Victorian London, and the Great Wall of China. The site also includes a simple content management system, allowing designers working for the BBC to quickly create and add new dimensions. This responsiveness was used to great effect when the Pakistan floods occurred: the devastating enormity was brought home to visitors, and howbigreally.com was used as a communication tool by charities and individuals world-wide, sharing their knowledge of this event. In its first 30 days, the website was visited 290,000 times (1.3 million page views), by 245,000 unique visitors. It received write-ups from major news outlets including the Guardian and Gizmodo.